See Ultra in action with our free PRT network design and simulation tool. ATS/CityMobil runs on all recent Windows PCs. Once you have received and downloaded a copy run the installer program. The installer will launch the program when it finishes; to run the tool again, use the ATS CityMobil link in the Start Menu, under Programs. When you run ATS/CityMobil, you will first be shown the startup window (above). Before creating a new network, it is helpful to understand how the simulation works by looking at an existing network design. 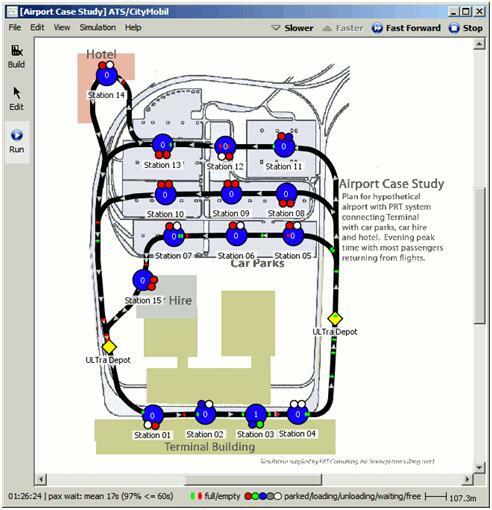 Click Open Case Study with either Urban Case Study or Airport Case Study highlighted (below). 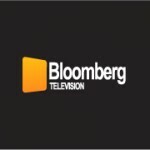 The network you have selected will appear on the screen. The PRT guideway is represented by thick black lines, with passenger access points (stations) depicted as blue circles and vehicle storage depots shown as yellow diamonds. The direction of flow is shown by white triangles. Click View in the main menu at the top of the screen, and use the commands there to look more closely at the selected case study. You can also use the mouse or keyboard to change the view. Right click and drag, or use the cursor keys, to move around. Use the mouse wheel, or the square bracket keys ] [, to zoom in and out. Click Run in the top left hand corner of the screen. After a short time you will see vehicles moving around – these are represented by green and red spots on the screen. The simulation is initially set to run in real time. To speed up operation of the simulation, click on Faster, which will appear in the top right hand corner of the screen. If the simulation does not run, you may have inadvertently altered the network. The green tick at top right shows whether the network is complete. If not, try reloading the network (from the File menu) and try again. The simulation runs for a greatly accelerated 30 minutes unseen before the screen display opens, so that the system is fully loaded. Green: When passengers board a vehicle it becomes green in a station, and once boarding is finished the vehicle automatically starts its journey and is displayed as a green moving spot. Blue: When an occupied (green) vehicle reaches its destination, it usually takes around a half a minute for the passenger(s) to disembark. The vehicle’s color is changed to blue during this unloading phase. Red: Once the vehicle has been unloaded, it is ready to carry another passenger, and is colored red as it either waits in the station or is moved to another station or back to a depot. gray: Sometimes occupied vehicles have to wait momentarily in a station for a time slot to be cleared throughout their journey and are colored gray while waiting. In times of low passenger demand, many empty vehicles can be seen waiting in the stations. If a passenger arrives and begins boarding a vehicle, that vehicle’s color will change to green. Normally the boarding process takes about a (variable) half a minute, so you can see a number of stationary vehicles displayed in green at any moment. This can be hard to see if the simulation is running quickly. If a passenger should arrive at a station with no empty vehicle available, that passenger must wait until a vehicle arrives. Waiting passengers are shown by a numerical display at each station – this is zero if no passengers are currently waiting. The timing of each passenger arrival is completely random. This is controlled by a random number generator within the software and is an important part of the simulation. More detail about passenger demand levels is given below. Each “passenger” represented by the simulation is in fact a group of passengers traveling together, and up to four people can be carried in each vehicle. Moving vehicles all travel at identical speeds and are automatically controlled by the ‘synchronous’ control method. Every journey is given a uniquely different timing so that vehicles always arrive at merges with adequate separation between them, at a minimum 3 second headway. This may be hard to see at certain magnifications – zoom in to see what’s really happening at the merges. The vehicles keep going until they reach the passenger’s chosen destination; they do not stop at any intermediate stations on route. All the stations (and depots) are assumed to be ‘off-line’ i.e. the loading/unloading berths are physically separated from the guideway. Thus vehicles can continue traveling past the station at full speed without affecting the vehicles parked at the station or the passengers getting on and off. Stations can be of any size and shape in order to integrate with existing architectural features – this is not represented on the screen display. In the simulation, all the stations are represented as idealised circular shapes. While the software does not allow detailed station design, the guideway lengths, journey distances and times are all accurately represented. Each station shown on the screen has up to five vehicle berths, which are displayed as white spaces if there is no vehicle currently parked in them. (Actual ULTra stations can have more than five berths, but this requires a more complex simulator). Note that when vehicles occupy the berths, their positions are not displayed realistically because the berth displays are filled clockwise – if only one vehicle is present in the station, the least clockwise berth display will be illuminated, if two vehicles are present the two least clockwise displays are illuminated and so on. When one vehicle leaves or arrives at a station, it may appear that the remaining vehicles move along from one berth display to the next. This is a product of the display only, and is not representative of the way a station operates in practice. When running, the screen shows the elapsed time and a running average of passenger wait time at bottom left. The distance scale and key to the vehicle colors is at bottom right. Holding the cursor over a station brings up a box summarising the current status of the station. At top right, Fast Forward turns off the dynamic display and calculates the rest of the simulated period very rapidly. At the end of the 2-hour simulation period, the Results screen summarises the mean wait time at each station and overall, the percentage of passenger groups waiting less than 60 seconds, the numbers of passenger groups carried, and the number of vehicles used. You can copy these results into another program by right clicking on the results table. This simulation does NOT optimise the fleet size: it calls up as many vehicles as are required to respond to passenger calls. In practice, fewer vehicles might be provided and the mean waiting time would be somewhat longer. Stop (top right) stops the simulation at any time, and displays the results collected so far. 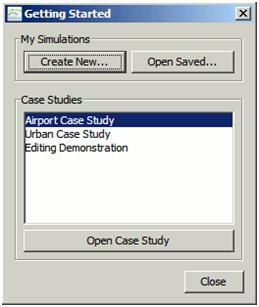 To follow along, open the Editing Demonstration case study by clicking File > Open (the simulation has to be stopped first; if you are running a simulation, first click Stop and close the results window). Click Edit at the top left of the screen. Now you can use the mouse to move elements of the network around. Place the mouse over part of the network and click and drag the network element to a new location. Whole track sections can be moved, and nodes can also be moved around, whether they are depots, stations, or plain track nodes. Track curves can be edited in two ways. Click the mouse onto the white square node point by a track curve. The node turns green when it is selected. You can then drag and drop the corner to a different location. Alternatively, once you have selected a particular track curve a handle or pair of handles will appear colored orange or magenta. Dragging the orange/magenta handle will change the radius of curvature of the track without moving the position of the rest of the track. Note that when editing curves on a large network it may be necessary to move to a high zoom before the curve radii and handles can be seen. The Edit menu at the top of the screen allows you to undo or redo editing changes. If you click on a station or track section, so that the relevant white squares turn green, this menu also allows you to delete the selected item, or you can press the Delete key. In the Editing Demonstration example, if a station is deleted there is only one left, and an error message will be given at the top right of the screen until another station is inserted. Note that when a track section is clicked so that nodes at each end turn green, both nodes and attached track sections will be deleted, i.e. three sections if two nodes are highlighted: if a station is centerd on one end of the indicated section, it will be deleted. It is better to click on a single node and delete it and the two track sections attached on either side. First clear the screen by selecting File > New. After deciding whether or not to save any unsaved changes to your own file, you will be prompted to import a background picture. For now, select Do not use a map, and click Finish. Click Build at the top left of the screen, and you can begin to design an ULTra network. First choose where you want to put stations. Position the mouse appropriately, then click, and a dialog box will appear. If you simply click OK, a station will appear. There are also options to control the relative passenger demand at the station by using the slider or to make a vehicle storage depot instead. You can name each station, or simply accept the default numbering. Create as many stations as you like, up to a limit of twenty. Note that you must have at least two stations and one depot for the network to be viable. Once you have the stations in place, you can begin to link them up with guideway. Position the mouse over one of the stations, press and hold the left mouse button and move the mouse to an adjacent station. If you release the mouse button whilst the mouse is positioned over a station, a section of guideway will appear linking the two stations. Alternatively, releasing the mouse button whilst the mouse is not positioned over any station will create an intermediate node – the track will appear to end at this point. Continue the guideway by positioning the mouse over the end point and dragging and dropping the mouse as many times as you like to create complex guideway geometries. All guideway is one-way only. 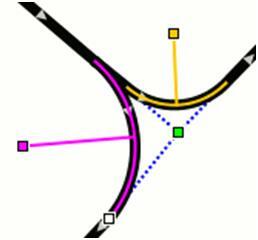 It is important to construct complete one-way loops, and where loops interconnect to ensure consistent directions of flow. If a network is not complete in this sense, a message at top right will red flag the failure. If you have not connected a complete loop, the track ends will be a green node with a red border, while connected nodes have a black border. If the gap is too small to introduce a new section of track, use the Edit menu to undo the last drawn section, and then reconnect. A demerge (split) can be created by positioning the mouse over the mid-section of a piece of guideway, holding the mouse button down and dragging and dropping. To create a merge, click on an existing network feature, hold down the mouse button and drag the mouse into a position on the mid-section of a piece of guideway. A merge will be created when you release the mouse button. Note that it is necessary to have a certain distance between nodes, so you may get an error message if you try and create a merge or demerge where there is insufficient space because it is too close to another node or station. Use the Edit tool to pull the nodes further apart. If a guideway is drawn across an existing guideway it is assumed that it passes under or over that guideway: it connects to it only if it is explicitly drawn into a node on the existing guideway. If you prefer, it is possible to draw the guideway first and add the stations later. If you click the mouse on an existing track node (a white square), a dialog box will appear entitled Node type. Choose station or depot, enter a name as appropriate and click OK. Use the same procedure to remove unwanted stations from a network – click on the station (or depot) and when the dialog box appears, select Plain Node and click OK. Similarly, an existing station can be renamed. The network must contain at least one Vehicle Depot. These must be located on the guideway in the same way as a station. When you have finished entering the network, try running the simulation. Look at the message in the top right hand corner of the screen. It will say All OK if it is possible to run. If it is not possible to run the network, you will see an error message here. Click on the button to get more information. If the track is overloaded, you will need to reduce demand or change the network to reduce the traffic on the congested link. The network can be saved to files and reopened using the File > Open > Open Saved…. The appearance of the network can be changed via the Simulation > Appearance menu. 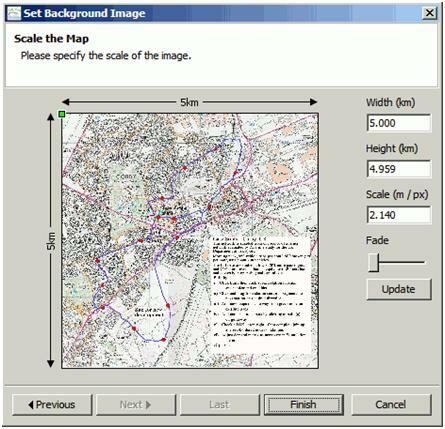 It is normally easier to design a network if you use a background image, for example a map or an aerial photograph. It’s best to load this image first. Click File > New and this time select Load map from a file, then click Browse. Once you have found the appropriate image file, click Next. It is important to scale the map properly before you start drawing the network, and several eatures are provided to help with this. You can enter the height or the width of the map (in km) then click Update. You can also enter the scale factor if you prefer. It is only necessary to enter one of these parameters; click Update and the other two parameters will be adjusted automatically. Most background images are too dark to work with, so adjust the Fade slider until the background image is right. When you are satisfied, click Finish. The background map of a network can be changed, rescaled or faded at any time via Simulation > Background Image. Passenger demand can be specified in two ways. The first way is to let the simulator distribute the demand using a gravity model, based on how you set the Demand sliders provided for each station. The second way is to enter a demand matrix, which specifies the number of vehicle trips between each pair of stations. 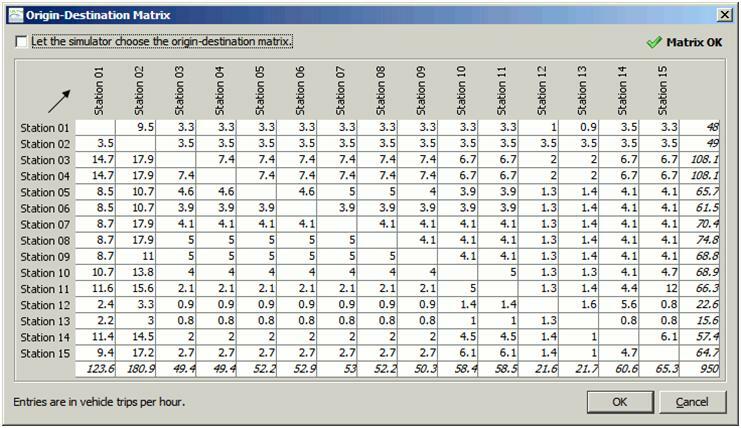 To enter or change the demand matrix, select Simulation > Origin-Destination Matrix in the Simulation menu. Uncheck the box marked Let the simulator choose the origin-destination matrix, and it is then possible to enter numbers directly into the origin-destination table. Origin stations are listed in the left hand column, destination stations are listed across the top row. Click and drag to highlight individual cells, entire rows or columns, or the whole matrix. Right click brings up a menu including Scale and Set. Selecting either produces a window in which the highlighted numbers can be multiplied by a scale factor, or set to a given value. The number traveling into and out of each station is limited to 300 vehicle trips per hour in total. The display will turn red and give a warning if you set the demand levels too high. In practice, ULTra stations are able to accommodate higher demand levels than this, however this requires a more advanced simulator to demonstrate. 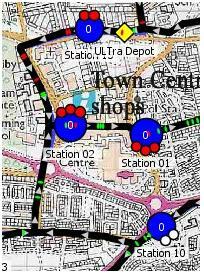 The software automatically moves (red) empty vehicles around to balance the distribution of available vehicles. If a loaded vehicle arrives at its destination station and there is no empty berth, an empty vehicle at the station may be pushed out to make room for the arriving vehicle, and will then be directed to another station where an empty vehicle is required, or back to a depot. At low levels of demand, each station will be given a minimum of two berths even if the demand justifies only one berth, since the second berth represents space for a vehicle to wait, if necessary. 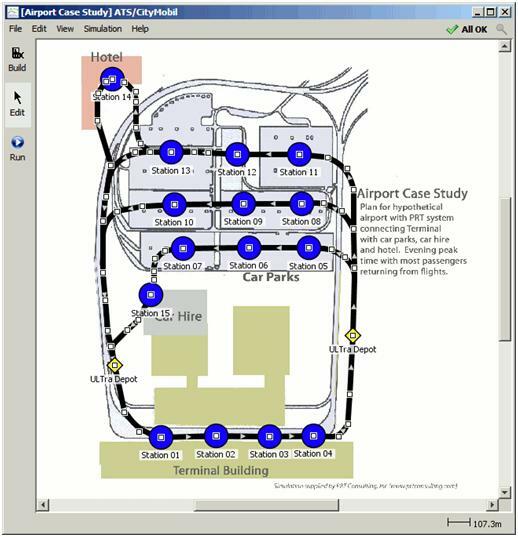 This simplified simulation will often fill both spaces with empty vehicles, because it operates by always answering a passenger call as quickly as possible. For this reason, at low demand this simulation tends to over-estimate the fleet size required, and in practice it will be more economical to reduce the fleet size and allow mean waiting times to increase slightly, since in these circumstances mean wait times will be very low. This trade-off is not available here, but can be examined in ULTra PRT’s internal simulation tools. At higher levels of demand, if waiting times are too high, it is a good idea to introduce more depots onto the network upstream of stations with unacceptably high waiting times: in practice, these “depots” need be simply storage space for empty vehicles. 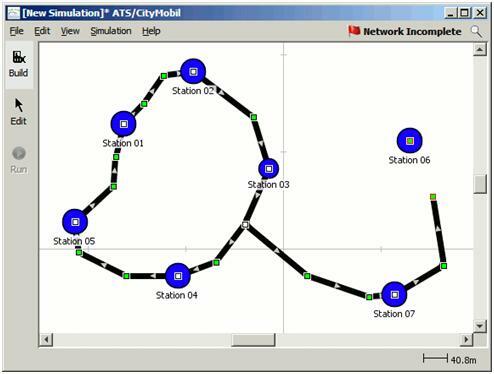 In this simulation, the same software is used to manage empty vehicle movements on all possible different network geometries, so empty vehicle circulation might not be optimum on certain types of network. For example, networks with small numbers of stations spread over a wide area, or networks with too few depots, may need special optimisation to achieve maximum efficiency. The software tools to perform this optimisation are not available with this simulation, but are available in ULTra PRT’s internal simulation tools. Download the Simulator Tutorial PDF. Download the Ultra Simulator (20MB .EXE).